I dislike cooked carrots and Ola, mushrooms. We're both a tad better with our picky-ness now (is that part of growing up?) but there was a point where every time we ate together and there were cooked carrots and/or mushrooms involved, they would be picked out by the respective disliker and placed onto the plate of the other. Needless to say, I LOVE MUSHROOMS. All kinds; in any dish with any sauce or broth. Oyster, shiitake, crimini, portobello, enoki...yum! 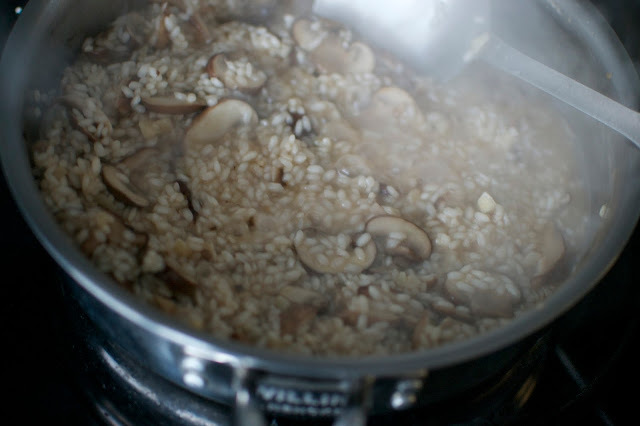 A couple years back, when I was in the process of finding a job and filling my time with teaching myself how to cook, I came across a recipe for mushroom risotto on Pinterest. As per usual, I pinned the delicious photo and moved on. When I was sifting through my cluttered Pinterest board for a dish I could easily make for a group of 8, I clicked into this recipe and decided to try it out. And now, it's among my favourite go-to recipes! Risotto sounds fancy, but most of the work is simply in stirring and patiently waiting (: The only downside I've found with risotto is that it doesn't get better with time, like the best leftovers-for-lunch dishes do; so it's best served right away. The best part about risotto (or maybe just this risotto? I'm not well-versed in risotto-making), is that it's flexible! I've made it with various types of mushrooms (whatever we have in our fridge) and varying dryness of wines (again, whatever we have) and have yet to ruin it. My favourite mushrooms to use though, have been crimini, oyster, and/or shiitake. It's a good thing that I wrote this recipe down on a recipe card, which isn't what I usually do, because last time I tried to find the recipe via the link on Pinterest, it was nowhere to be found! 1 Warm chicken broth in a pot and keep on low heat. 2 Prep mushrooms and shallots/onions. 3 In a large saucepan or pot, heat oil over medium to high heat. 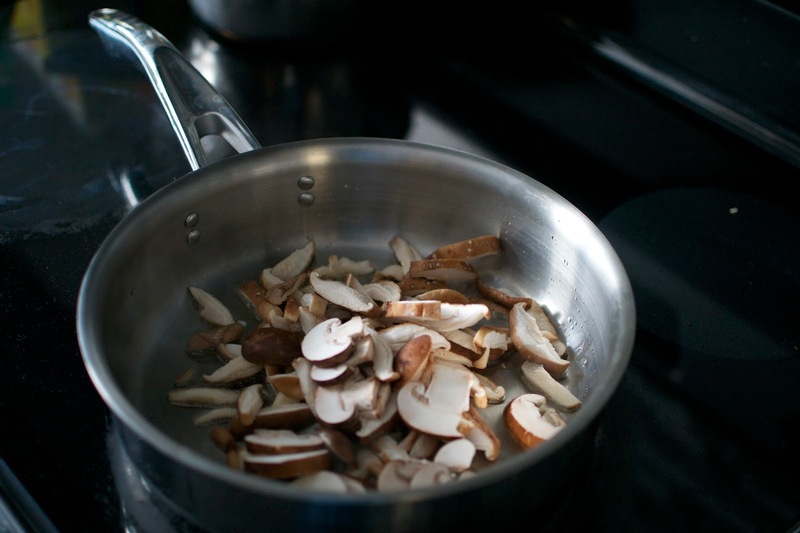 Sauté mushrooms and shallots for 5-8 minutes; until mushrooms are tender. 4 Stir rice into mushroom and shallot mixture and toast for two minutes. 5 Add wine and stir frequently until almost all wine is absorbed/vaporized. 6 Add ½ cup of warm broth and stir frequently to avoid sticking. Add another ½ cup of warm broth once 80-90% of first helping has been absorbed by the rice. 7 Repeat step 6 until rice is at desired texture (approximately when all broth is used). 8 Turn off the stove and stir in grated parmesan cheese. Plate and garnish with parsley. 9 Serve hot. Yields roughly 6 main course servings. I need to try this!! When i have a proper pan.